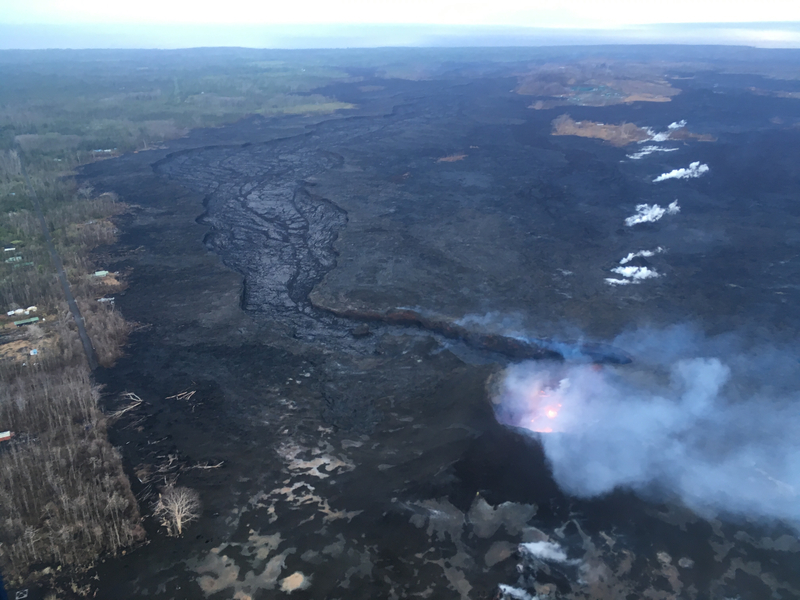 Saturday, Sep 1, 2018, 6:00 pm – Kilauea's lower east rift zone overflight: Another angle of fissure 8, with a small lava pond within. 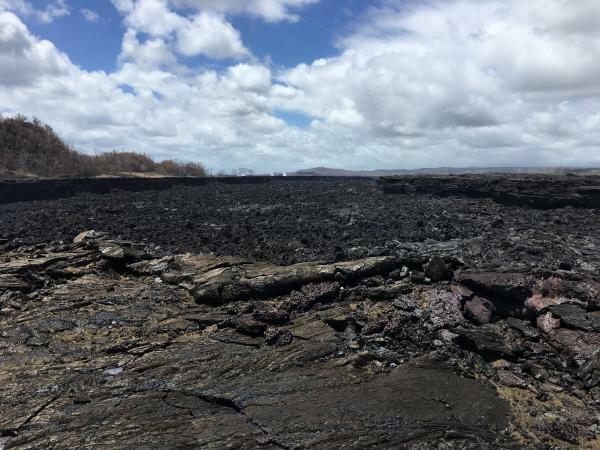 While no glow or incandescence was reported within Fissure 8’s cone for most of the week, Saturday 9/1 showed a few life signs remain in the LERZ: weak spattering from one spot, and in the evening new lava came out to cover most of the crater floor. But its sides have been slumping and falling in, as have the levees of the now solidified lava channel. While Fissure 8 and some of the surrounding vents continue to steam and fume, SO2 emissions remain low there and at the summit. 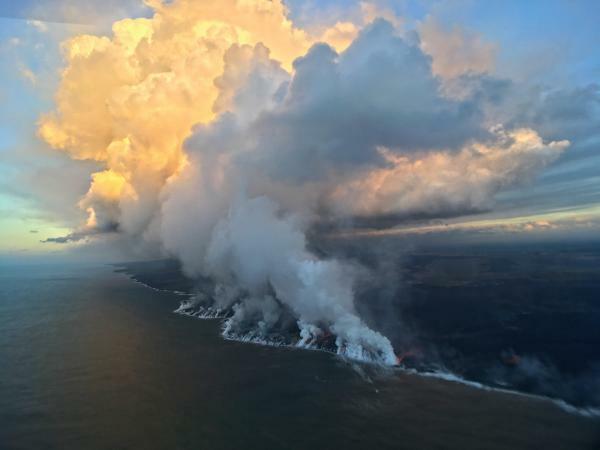 No active ocean entries have been seen for the past few days, suggesting that all the residual lava from Fissure 8 has stagnated or drained out. This week has been a time of repair and taking stock. USGS geologists have been replacing lost or damaged monitoring stations (including the UWE tiltmeter, back on HVO’s deformation page). 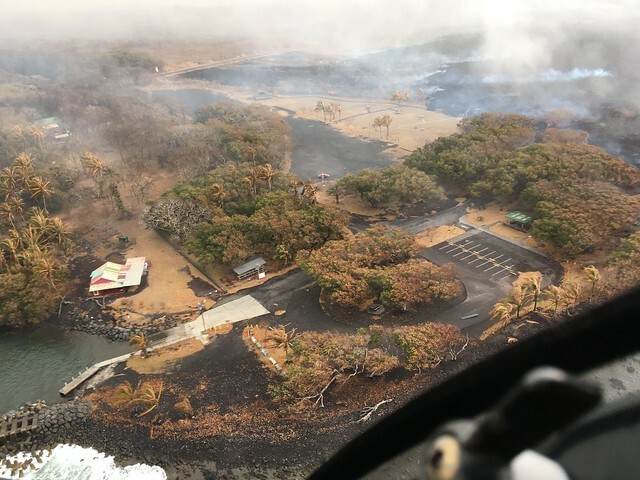 The drone crews have been out after Hurricane Lane came through to take new detailed aerial surveys of Kilauea’s summit (August 30 video) and Fissure 8 (August 21 video). 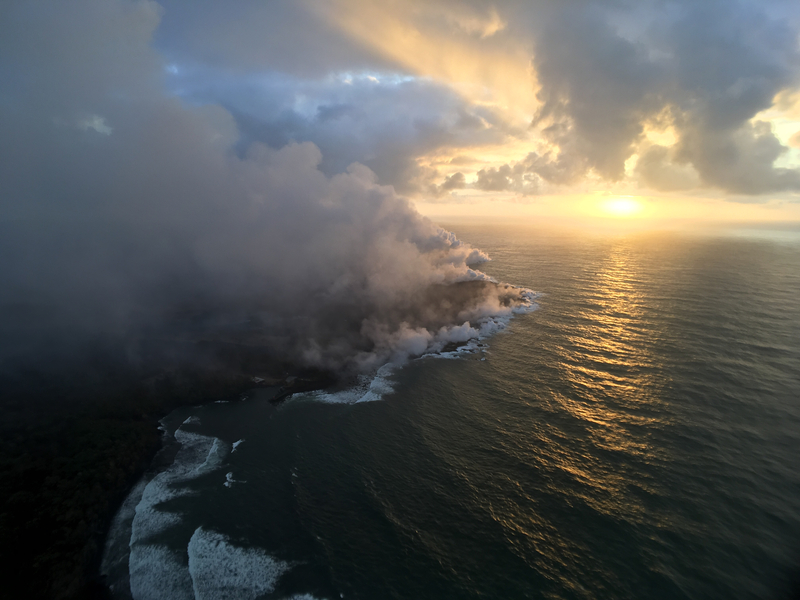 Screencap from August 30, 2018 UAV video survey of Kilauea summit. 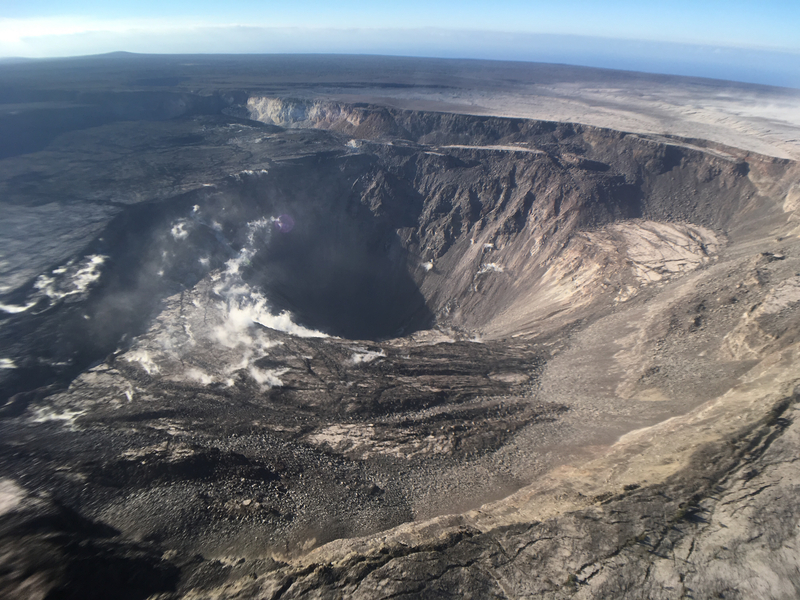 This week’s Volcano Watch newsletter from HVO describes how “Scientific community lends a hand to measure Kīlauea’s changing shape.” This eruption required all hands on deck and every last scrap of equipment they had, and then some. 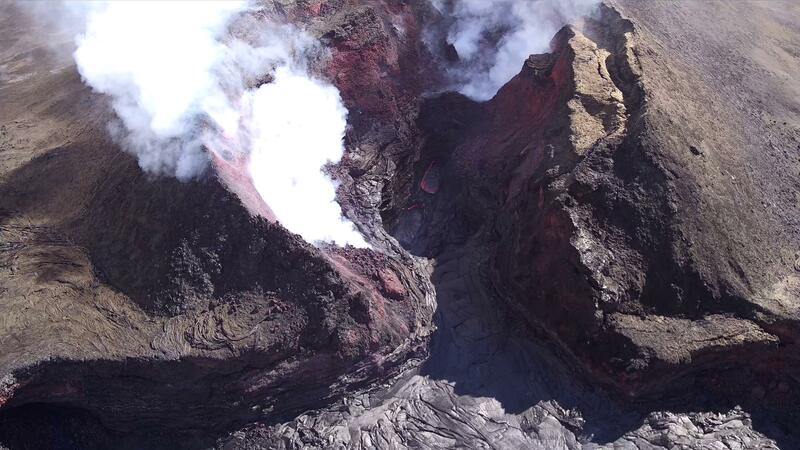 Another screencap from the August 30 drone survey of Halema’uma’u Crater and its surroundings. Piece of Crater Rim Drive a long way down in the crater.More photos after the cut, plus some notes on the park’s status. Negligible. There’s a few residual bits of lava oozing into the ocean at Ahalanui. Otherwise, there’s not much going on at the summit or LERZ. In light of the reduced eruptive activity at Kīlauea Volcano over the last several days, HVO is lowering the Alert Level for ground based hazards from WARNING to WATCH. 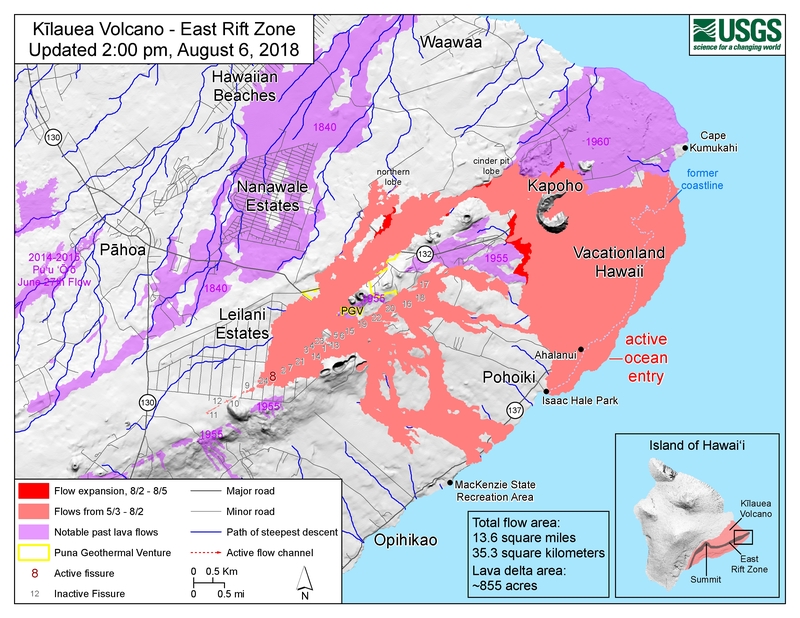 This change indicates that the hazards posed by crater collapse events (at the Kīlauea summit) and lava flows (Lower East Rift Zone; LERZ) are diminished. 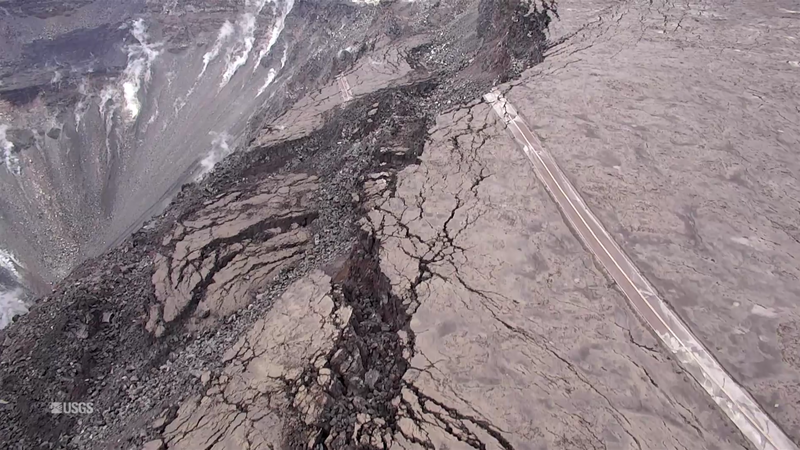 However, the change does not mean with absolute certainty that the LERZ eruption or summit collapses are over. It remains possible that eruption and collapse activity could resume. 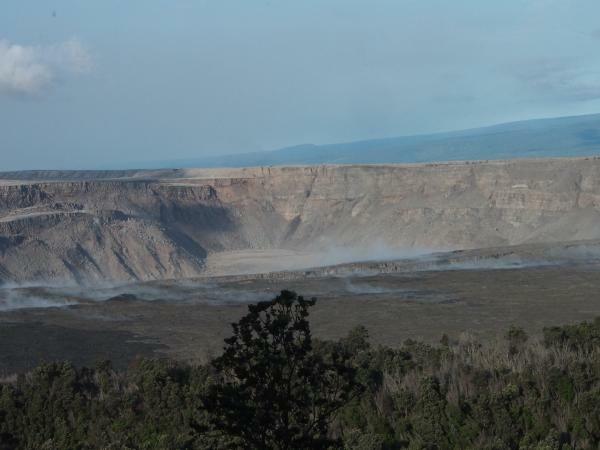 Kīlauea Volcano has remained quiet for well over a week now, with no collapse events at the summit since August 2. Except for a small, crusted-over pond of lava deep inside the fissure 8 cone and a few scattered ocean entries, lava ceased flowing in the LERZ channel on August 6. Sulfur dioxide (SO2) emissions rates at the summit and LERZ are also drastically reduced (the combined rate is lower than at any time since late 2007). 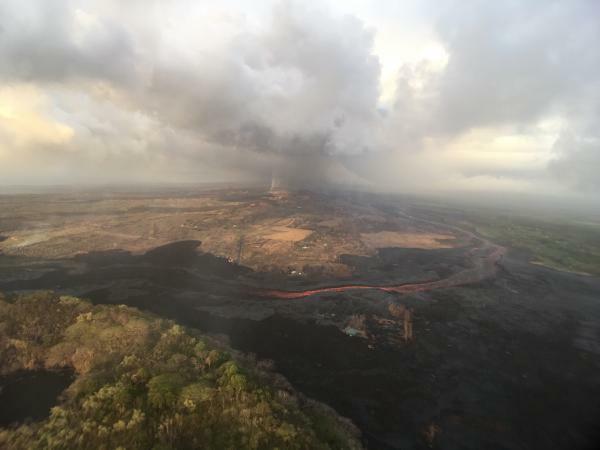 It remains too soon to tell if this diminished activity represents a temporary lull or the end of the LERZ lava flows and/or summit collapses. In 1955, similar pauses of 5 and 16 days occurred during an 88-day-long LERZ eruption. During the Mauna Ulu eruption (1969-1974), a 3.5 month pause occurred in late 1971. 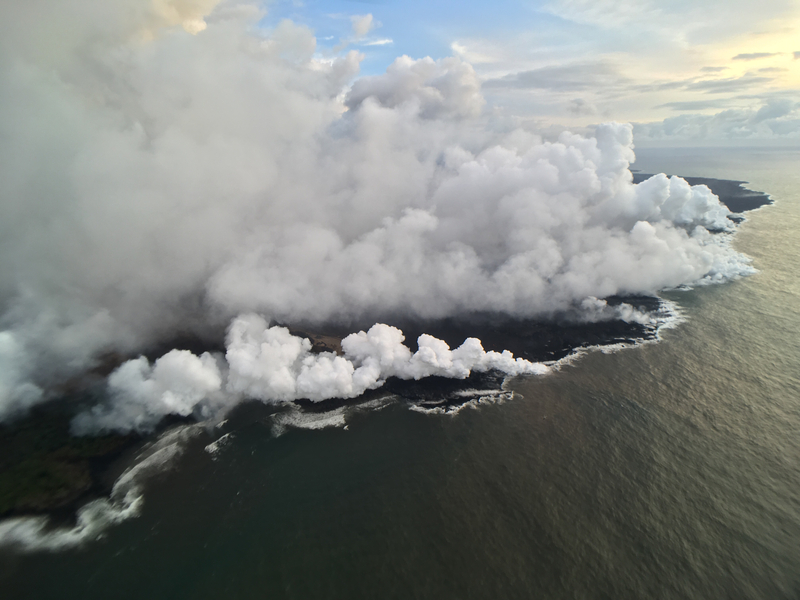 HVO will continue to record detailed visual observations and scrutinize incoming seismic, deformation, and gas data, looking for evidence of significant movement of magma or pressurization as would be expected if the system was building toward renewed activity. So it’s finally arrived, the end (or at least intermission) of Fissure 8’s endless outpouring of lava from May 27 to August 4. The shutdown happened at the end of last week over a period of just 2-3 days. Fissure 8 isn’t quite dead. There’s lava pooled deep down the cone, bubbling weakly. Residual lava is still draining out of the lava delta into the ocean, some of it quite near the now-famous Pohoiki Boat Ramp. But most of the surface channels have drained and solidified. The volcano’s summit has settled, too. The caldera floor isn’t inflating or deflating, and the swarms of earthquakes and summit collapses have stopped. 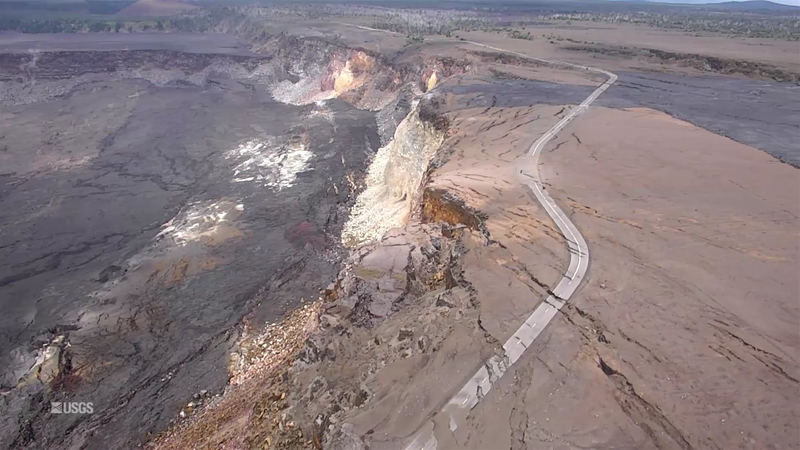 So now the question becomes: how long do geologists, national park staff and residents wait before deciding it’s safe to start repairing the damage? Past Lower East Rift Zone eruptions have paused for days, even weeks. 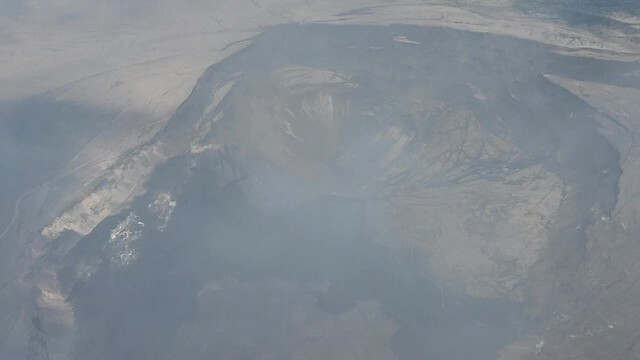 So scientists and officials continue to warn that this eruption could resume at any time. 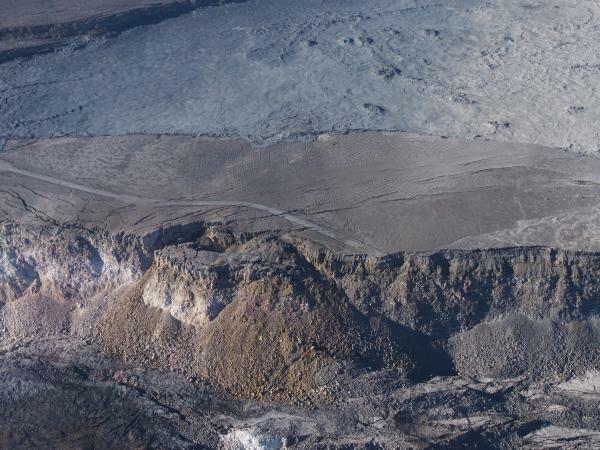 Also, it looks like I missed an August 6 USGS news media briefing discussing the eruption’s apparent shutdown (full audio). Now let’s look back at recent images and videos posted on HVO’s Photo & Video Chronology page, which only shows the 10 most recent posts— so these are visible there now, but won’t be in the future. 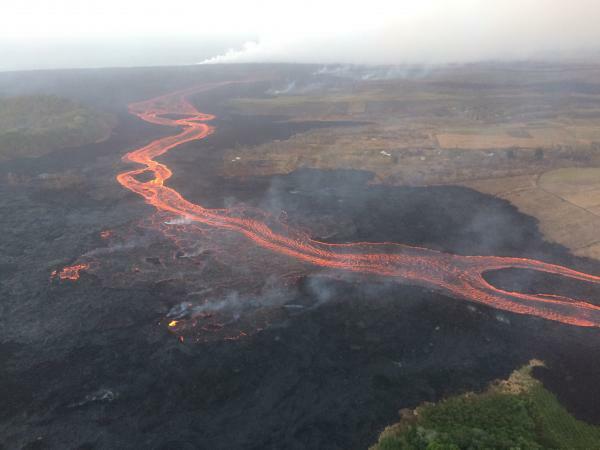 Little lava is leaving Fissure 8 today. It’s still bubbling away within the cone, but the channel below it is crusted over, with only residual lava draining down towards Ahalanui and the edge of Isaac Hale Park, and almost no laze plume. The summit’s seismicity is way down, and there’s almost no inflation or deflation since August 3. 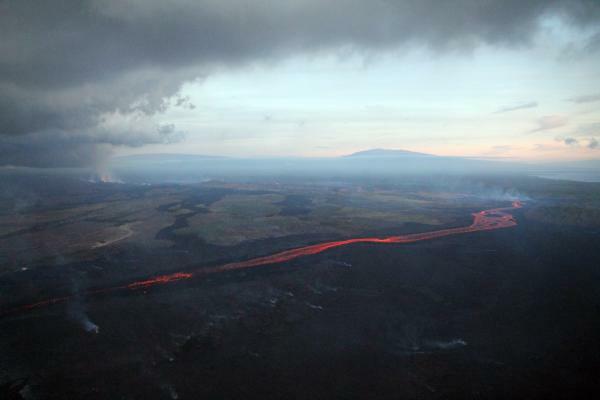 Now the question becomes: is this a temporary pause, or is this eruption really over? 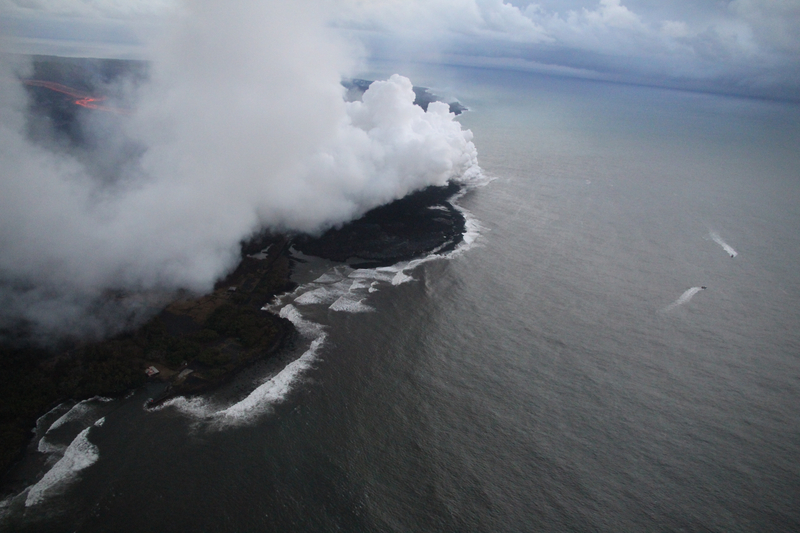 By the way, while trying to track down photos of the September 1982 lava flow, I found an old webpage (No datestamp, but Internet Archive first scraped it in 1999) with some interesting aerial photos of Kīlauea Caldera from the 70s and 80s. It would be fun to try to match the 1974 aerial photo with a new one, but I haven’t seen one taken from that high yet. 89 days. 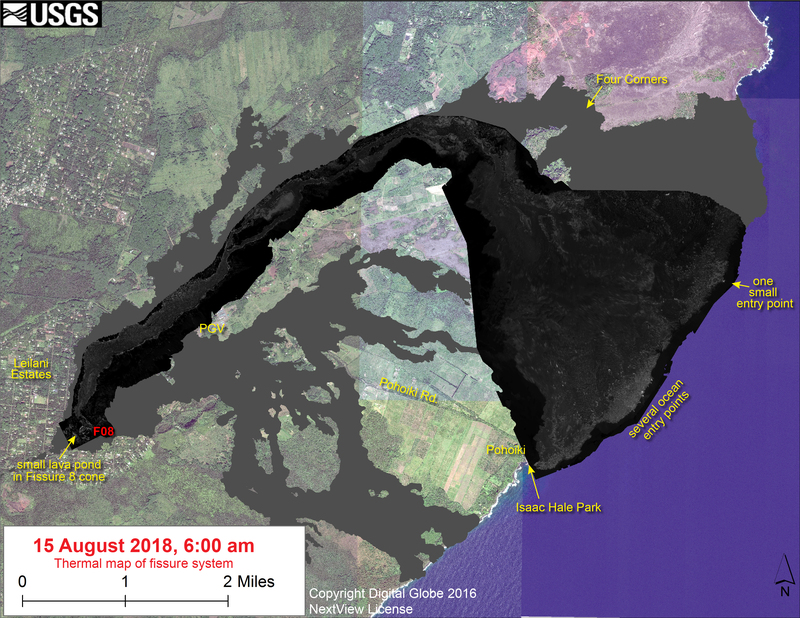 That’s how long it’s been since the first fissure started spattering lava in Leilani Estates. Which is one day longer than the 1955 Kapoho eruption, which had been the longest LERZ eruption since records started being kept. LERZ erupton as per usual. 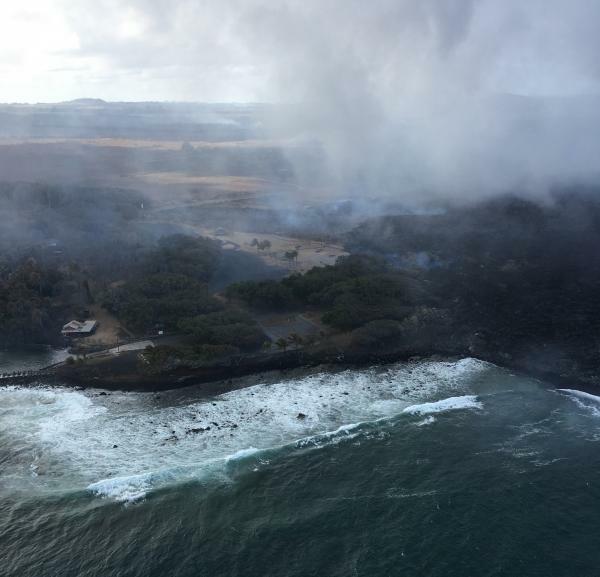 There’s “ooze-outs” of lava on the flow margin, but further inland from Pohoiki. Today’s M5.3 summit collapse was at 7:59 am, when the crater was steaming in the cool morning air. There was also a regular M 4.5 earthquake at 12:30 am. HVO/USGS has updated and reorganized their 2018 Activity page, with FAQs, resources, and links to photos and videos. 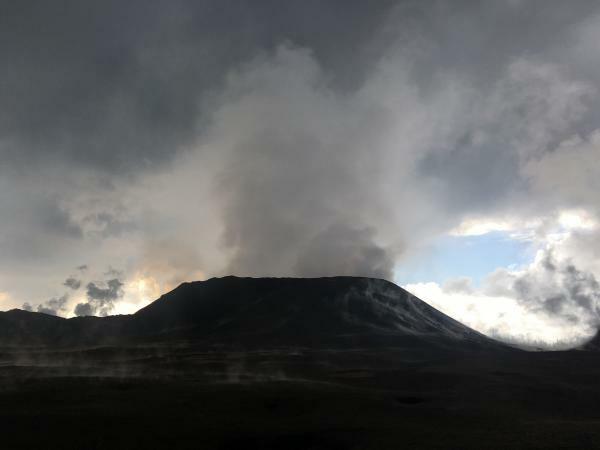 Eruption continues as usual with three minor things to note. 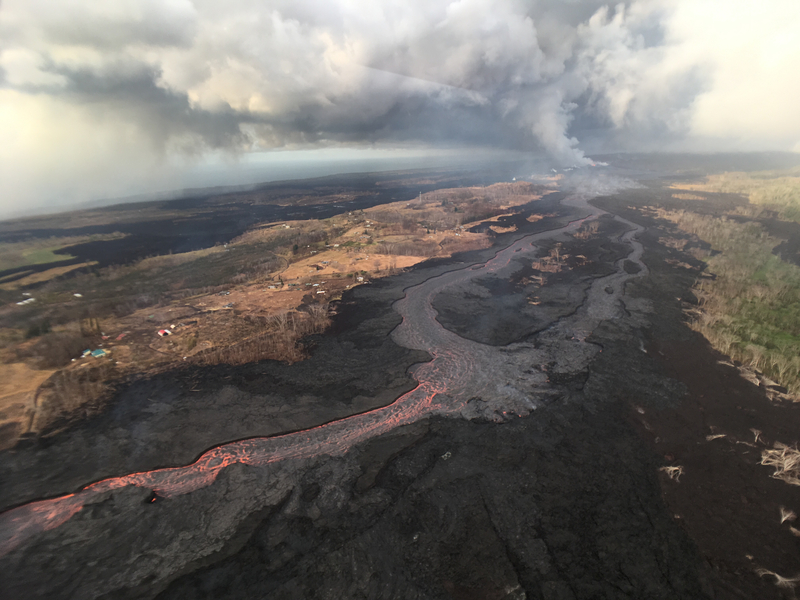 First: “fuming” on the southwestern margin of the flow near Pohoiki could mean possible breakouts, according to today’s HVO Kilauea status update. Same source also says that, rather unusually, a 4.1 earthquake at 10:02 pm was felt all the way to Hilo, far more widely than the stronger summit collapse events, possibly because it was at a depth of 7 miles. 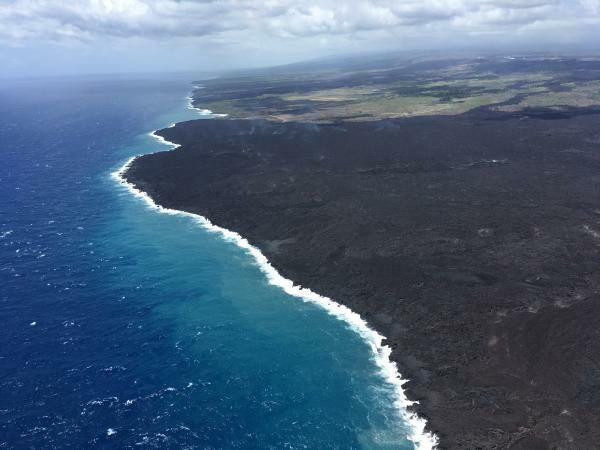 And finally, Tuesday will mark the 89th day of the eruption, surpassing the length of the 1955 Kapoho eruption which had previously held the record for the longest LERZ eruption since westerners arrived and began keeping records. 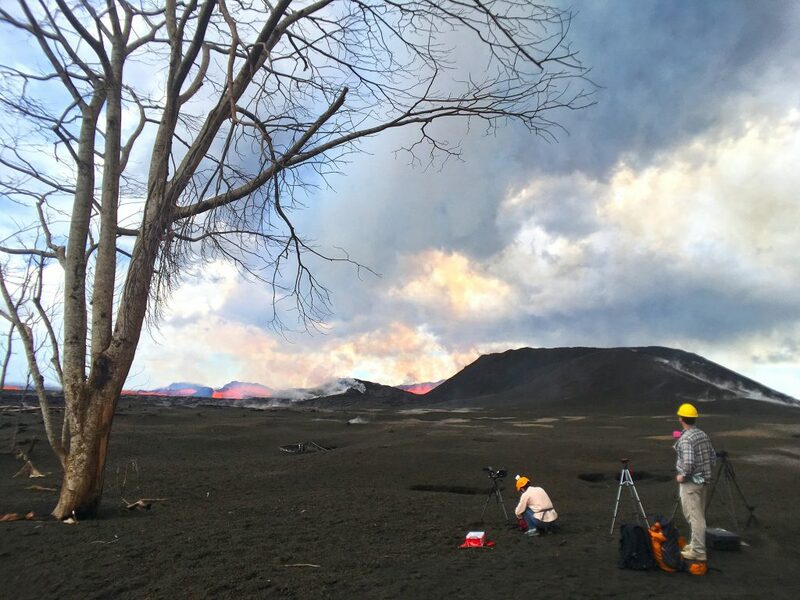 Erik Klemetti’s Rocky Planet blog in Discover magazine invites readers to “Check Out How The 2018 Eruption Has Changed At Kilauea’s Summit“. Although I suspect readers of this blog are well aware of pretty much everything in that post! 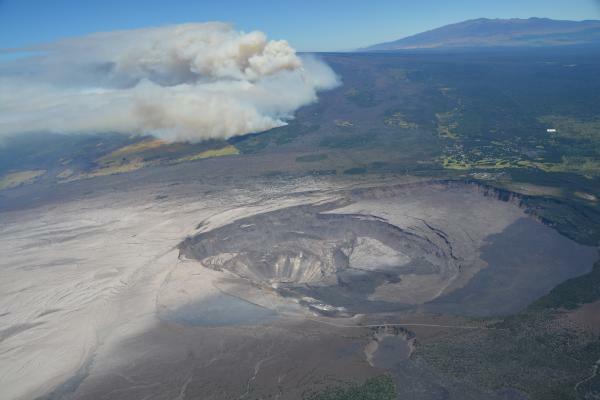 I tweeted him a question about “Halema’uma’u Caldera,” which he seems to be using instead of “Kīlauea caldera.” I know Halemaʻumaʻu crater has expanded so much it could be classified as a caldera now, but so far HVO scientists have resisted doing so, to avoid confusion with the larger, older caldera. As we approach the 3-month mark— or pass it, since Puʻu ʻŌʻō’s floor collapsed 3 months ago this past Monday— Kīlauea’s 2018 eruption continues with no significant changes. 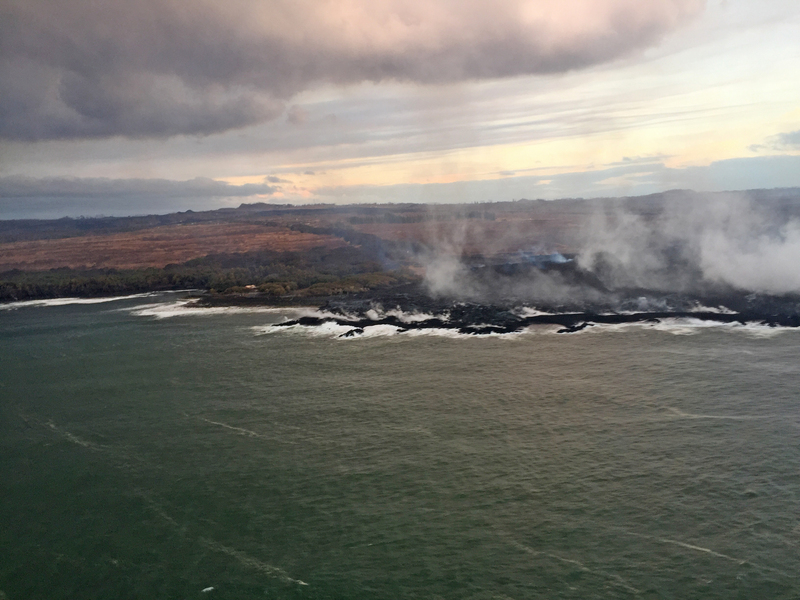 During the USGS morning overflight, the lava’s southwestern margin was holding at less than a tenth of a mile from Pohoiki boat ramp. The vigorous ocean entry continues a few hundred yards to the east. 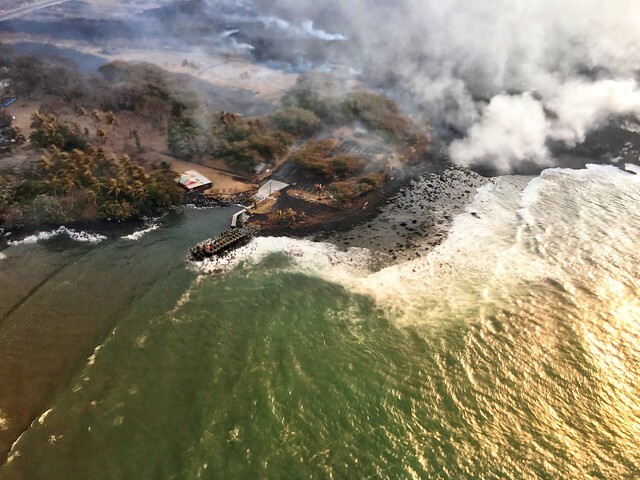 No surges in lava output have been reported at Fissure 8 since Tuesday’s 6:41 am summit collapse. Here’s HVO’s Steve Brantley giving the weekly eruption update at last night’s Pahoa community meeting (I’ll be transcribing it tomorrow or Friday). He explains that complicated “lavashed” map released earlier this week, which predicts where lava is most likely to go if there’s a breakout along particular stretches of Fissure 8’s lava channel. 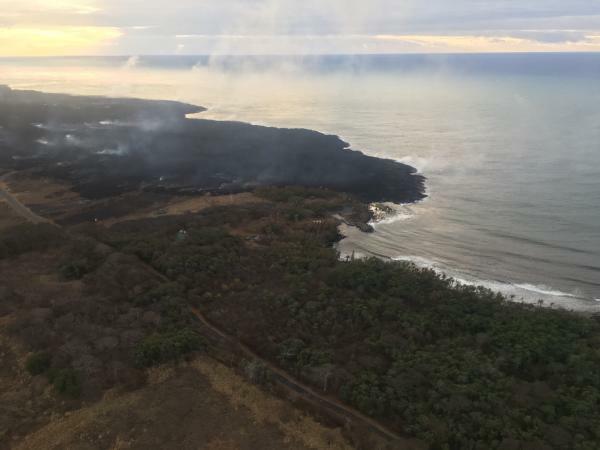 This is an aid to residents living in neighboring areas not affected by lava now, but who are worried about what might happen if the flow diverts. 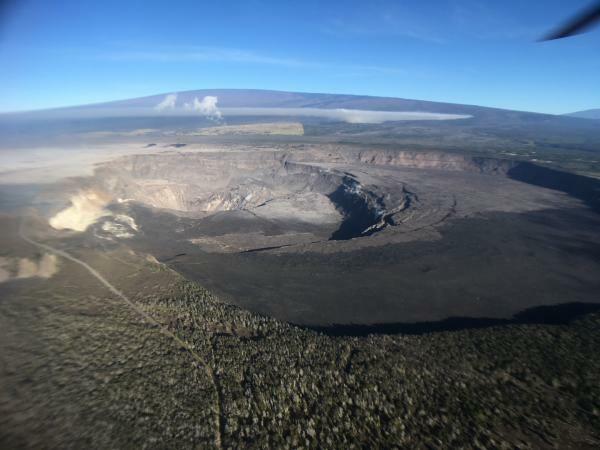 Field crews reported no surge at Fissure 8 following today’s summit collapse. 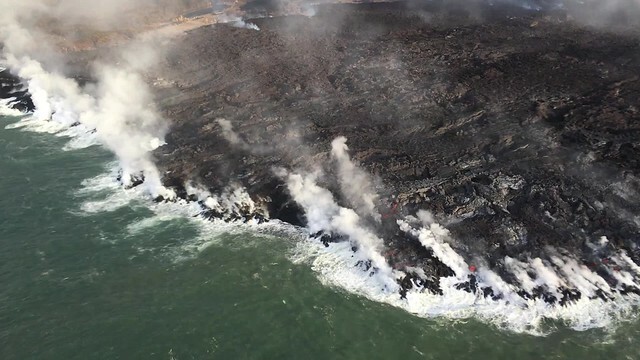 I notice the latest HVO Kilauea report says Fissure 8’s cone is down to 50 m, “or 55 yards.” It’s definitely crumbled or eroded— that may be responsible for some of the lava boats— but I’m never sure whether they’re measuring from the original ground level or the lava on which it sits. At any rate, the fountaining is lower, too, since it’s not rising above the lip of the cone. 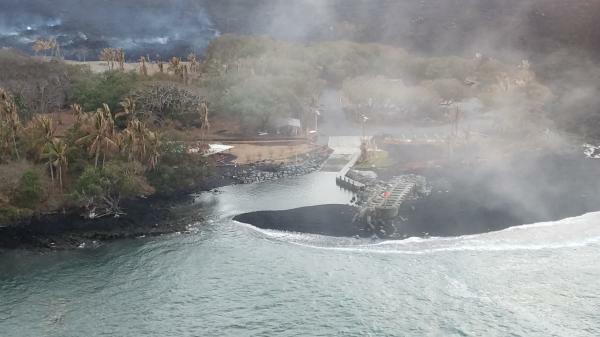 Down at the ocean entry, the main channel is still dumping into the sea from multiple toes near former Ahalanui. 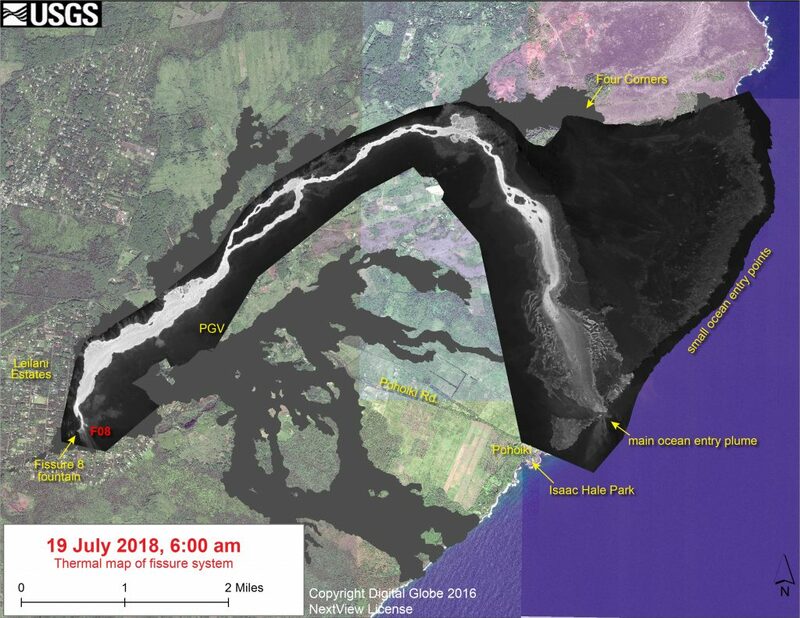 “Ooze-outs” are occurring along the west side of the active flow south Kapoho Crater, all the way down to the ocean (where it is threatening Isaac Hale). Look for Crater Rim Drive at lower left around 0:30, falling into the crater where it used to lead to the parking lot; HVO is really hard to glimpse at upper right. The Lower East Rift Zone eruption continues as per usual. 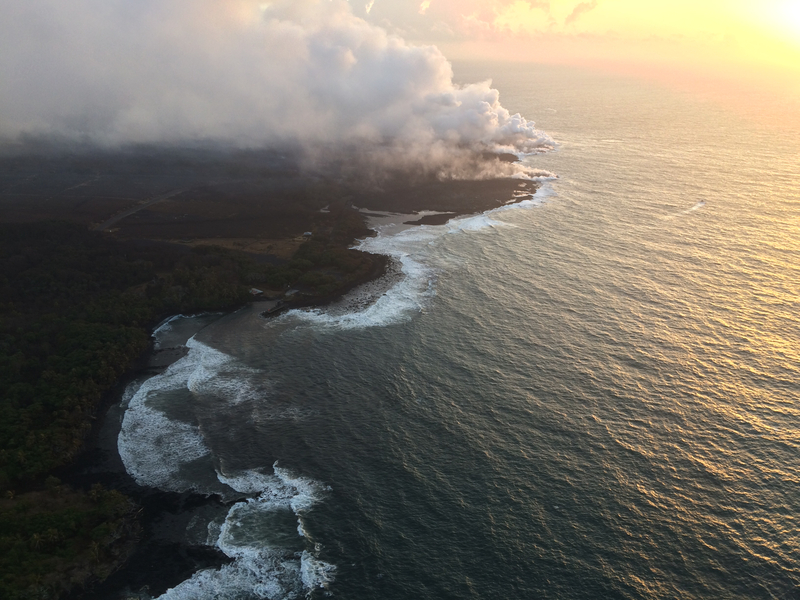 USGS reported during today’s morning overflight that “the channel was incandescent its entire length from vent to ocean entry.” There’s a main ocean entry a few hundred meters NE of the southern flow border with smaller pahoehoe flows on either side. The southern margin doesn’t seem to have advanced much from yesterday. 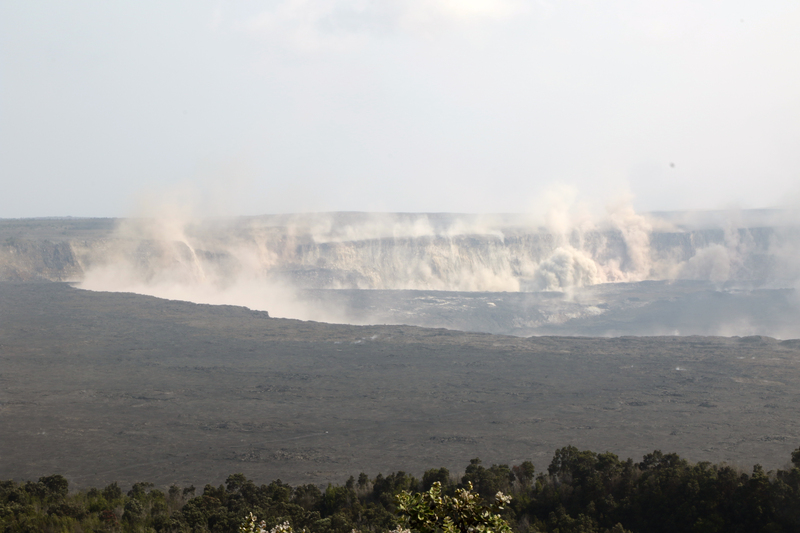 No other fissures are active, and I already covered yesterday’s 4:33 HST collapse event. I’m betting the next one will be after dark. State Highways have put a speed limit of 25 on Highway 11 between Mile Marker 28 and 30 due to cracks in the road. The USGS today released a new report for Civil Defense planning: “Fissure 8 Prognosis and Ongoing Hazards”. Here’s the July 19 thermal map of the LERZ posted this morning.